I can't believe that the FBI had a search warrant, at least not a proper one. So, they had no right in your house or to inspect anything or take anything. A good judge should throw out the case immediately. Roger should be able to sue the Federal Government for big bucks. Much of this stuff will stop only when enough US voters vote out the Democrats. Mueller does indeed have almost unlimited power if left unchecked, which he has purposefully been allowed to be by Rosenstein. He is a rogue Special Counsel, appointed in disregard of the rules and allowed to conduct a partisan probe, that is in fact an attempt at a coup. Just think about how the media treated Ken Starr compared to Robert Mueller. Even a cursory inspection of Mueller's record is outrageous in it's arrogance, prosecutorial abuse, and incompetence. He has cost the American taxpayer millions of dollars on overturned convictions, withholding exculpatory evidence and wrongful prosecutions. It is appalling that he is allowed to continue. I'm well educated but no lawyer, but your review covers much of the legal situation as I understand it. Trump has stated that he is, IIRC, "hands off" on everything having to do with Mueller. As I understand the legal and usual situation, Trump is fully within his rights just to tell his Attorney General (AG) just to FIRE Rosenstein, Muller, and everyone in the DOJ involved in any way. But my guess is that Trump won't even mention Mueller or even Rosenstein to any AG or candidate AG. Else the anti-Trump media would go 24 x 7 as long as Trump was in office screaming some made up violation of made up laws, rules, policies, procedures, traditions, norms, or whatever the media could turn into headlines and get eyeballs -- ANYTHING. All the law school deans, all the SCOTUS could swear on a stack of bibles and law books a mile high that Trump did NOTHING wrong, but the case before the public would take more time and effort than WWII and still have the NYT screaming "Impeachment! Treason! Jail!". So, Trump has a much better idea: Just let the Mueller witch hunt continue on. Then each month and each step Mueller takes, e.g., squeezing everyone Trump has known, or people who have known people who have known people who have known Trump, for the past 20 years, threatening to ruin their lives and their families, getting them to 'compose' and 'sing', will show everyone just that much more clearly that the whole Mueller effort is just, just as Trump has said consistently for years now, a "witch hunt". The result stands to get Trump a few million more votes in 2020. 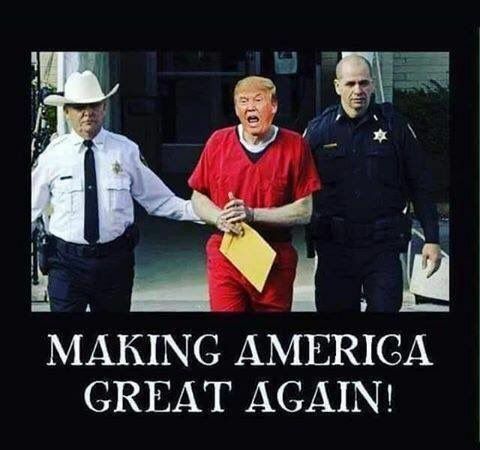 Then after the whole Mueller nonsense is over, from action by an AG or whatever, the country will be ready for some strong, new rules and laws stopping such witch hunts and much more of the dirty stuff at the top of the FBI and DOJ. Maybe everyone Mueller has hurt will get a few $million in compensation. Maybe Mueller and Rosenstein can be put in JAIL for long terms with their dance cards full everyday. Apparently the DOJ and FBI have long been wide open to a lot of really dirty, even highly illegal, stuff with next to nothing in "checks and balances". We were supposed just to "trust" them. Well, it's too easy for lawyers to conclude, e.g., from the actual practice of our 'adversarial system of justice', that anything they can get away with is sufficiently legal, justified, ethical, etc. ; the rest of the voters very much reject this attitude and its sometimes severe, wildly 'unjust' consequences. The first casualty in a legal case is the truth. NFL football and NBA basketball have referees that are MUCH more effective than what the DOJ and FBI have now; the DOJ and FBI need much more than just sports referees. In the end, Rosenstein and Mueller will look like dirty dogs and lose, and Trump will look like a knight in shining armor and win. It's a victory that has been long needed, e.g., back at least to J. E. Hoover and his dictatorial, Mafia like blackmail of much of the rest of our government. There is a lot of stink and rot in DC. Trump can't take on all of it all at once but has to choose his battles. But to win against Rosenstein and Mueller is relatively easy for Trump: Just let them continue and, then, lose and suffer from their own failures. What did the Crats have to do with this? The whole Mueller thingy was unethical, illegal, vicious Democrat partisans in the DOJ and FBI in collusion and a conspiracy out to cancel the Trump victory and drive him out of office. That includes Comey, Rosenstein, Mueller, Weisman, and all the dozen or so lawyers and Hillary campaign contributors working for Mueller. Muller's appointment letter by Rosenstein was at least improper and likely illegal. Mueller has gone past his too wide authority even in his letter. Also part of the scam were several others in the DOJ/FBI and all partisan Democrats out to undo the election. They were all working for Obama and Hillary, egged on by the ex-CIA guy Brennan and on behalf of Hillary. They all believed that Hillary would win, all made big bets on Hillary, all got on the Hillary team of a coup of the Federal government, and all believed that when Hillary won they would all be well rewarded and safe from their conspiracy. They cooked up the Dossier and used it in lies to the FISA court. They really did collude with the Russians. They gave Hillary a "7th floor special" for her national security violations with her e-mail setup and usage. It was nothing less than an attempted coup. All of that has been very clear and solid in the news for months. Are you starting to understand now? You just woke up from a 4 year nap? You've been to Mars and back? "Are you starting to understand now?" Clearly you HATE Trump. He doesn't need this job. He is giving up a LOT just to help the country. Still, you HATE him. You are being paid by Soros? You are buddies with El Chapo? You make money off slave labor? You make money importing cheap goods made by slave labor in other countries? You are a Russian agent? Okay, what do you have against Trump? Let us know, your top three, WITH credible, objective, detailed references to solid data? I'm for Trump, but I don't want to be wrong. So if there is something wrong, I WANT to know. So far there are LOTS of people -- Hillary, Pelosi, Schumer, Fauxcahontas, the NYT, CNN, MSNBC -- who REALLY hate Trump, but, still, so far the worst they have against him that has any credibility at all is just that at some state dinner he had an extra scoop of ice cream. Since that is the worst those diligent, intrepid haters have found, they have in effect given Trump a unique, world class clean bill of health. What do you have on Trump, e.g., other than smears, insults, rumors, gossip, deliberate lies, made up nonsense, fake news, and your cartoon? So far all you have is your insulting cartoon. You also have something for serious adults? Let us all know. We will be waiting for your heavy evidence. Just one thing. He is a lying POS. Okay, that might be serious, the lying part if not the rest. He exaggerates, in his confession, "harmless exaggerations". Like a lot of people successful in business, he uses ABC -- Always Be Closing. Recently maybe he has run up some trial balloons. But lies? Again, what are your three most significant examples, sure, with credible, objective references with solid data, e.g., exact quotes of what he said, with references, and why it was a lie. You have at least three examples, right? "If you like your doctor, you can keep your doctor. If you like your health care plan, you can keep your health care plan." "The only change you’ll see are falling costs as our reforms take hold." One that I always liked was his statement about the costs of an amputation. His cost figure was wildly too high, and right away the American College of Surgeons slapped him down hard with IIRC "uninformed, misinformed, just plain wrong, dangerous". The associated Web page is down now, but I still have a copy and can post it if needed. As long as you are shooting at Trump not just on "lies" but possibly everything else, what about what Obama did giving money to Iran that is still shouting "Death to America" and "Death to Israel"? What about how Obama dumped on our two best allies, England and Israel? What about Obama's IIRC "You can tell Vladimir that after the election I'll have more flexibility." Now that's REAL "collusion with Russia". We can also count Hillary with her famous lie about Benghazi and "That awful Internet video." -- a total lie; in fact, it had nothing to do with the attack. Let's see some Trump lies. You have some juicy ones, right, not to compete with Obama or Hillary but still juicy, right? So far, as an obvious Trump hater coming up with no evidence, you are just giving Trump a very clean bill of health. You talk the talk. Now lets see you walk the walk. Or time to show your cards, face up on the table, to put up. You don't have to give us your long, full list of Trump lies. Three of the worst will do. Since I don't want to be wrong about Trump, I'm eager to learn about your list of Trump lies. Once on the comments at 'Breitbart' I had a very similar exchange. Their main response was that they had too many Trump lies to post any -- gee, I only asked for three! Their next response was that they were too busy. So far you could be the same person. So, let me ask, as inquiring minds want to know, what is the going rate, say, in posts per hour, for paid Democrat Internet fora spam workers? In round numbers, per hour? No collusion, No collusion, No collusion. Your correct in saying, that just because a person doesn’t receive a speeding ticket, doesn’t mean they never broke the speed limit, however, it would be wrong, to just go ahead and assume, that, that person, did speed anyway, and without proof, punish that person for speeding, would it not? AGREED. It's like hes conducting a RICO investigation. Stupid he's allowed such latitude. "No collusion" is a Trump lie? Mueller has been going strong for 2 or so years and so far has found none, nichts, nil, nada, zip, zilch, zero evidence of collusion between anyone or anything having to do with Russia and anyone or anything having to do with the Trump campaign. Recently the Chair of the Senate Intelligence committee, with access to lots of highly classified information, and 200 witnesses said that they found no evidence. Where's your evidence or references to objective, credible evidence of collusion. Well, again, once again, over again, one more time, an anti-Trump spam worker has struck out, never hit the ball on any evidence and again in effect given Trump a unique, world-class clean bill of health. Only a fool would utter these words. Your "textbook" operation comes in second only to the ATF trying to arrest David Koresh in Waco. I suppose YOU would be OK with the SWAT team being called out for a parking ticket. I keep thinking that you can't get more brainless in your rude and tasteless comments, then you go on down the rabbit hole even deeper. Kevy is not only a fool, he is a vile, depraved ugly anti-Americn never Trumper. Everything, as you well know. Could you please click Quote Reply so we will know exactly to whom you are speaking? Thanks.